Reply 'To Mr Campbell Writer, Greenock C. his brother' Gives advice on treating 'flux' and the use of a laced stocking for the leg ailment. 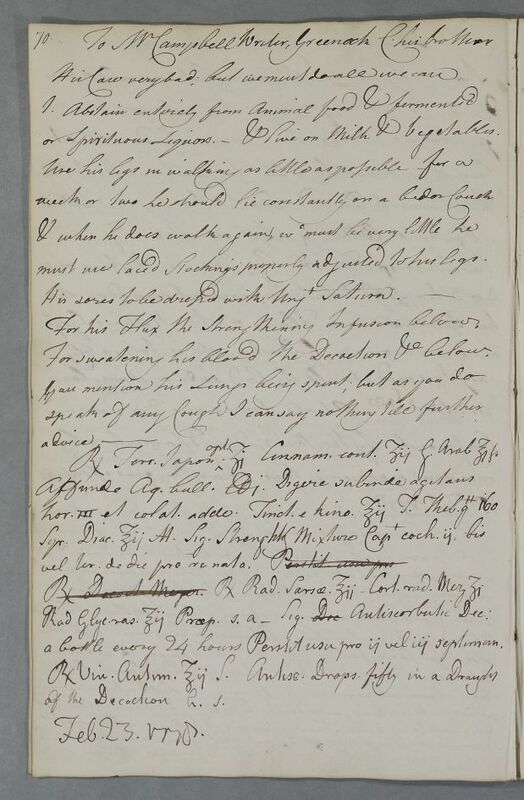 Summary Reply 'To Mr Campbell Writer, Greenock C. his brother' Gives advice on treating 'flux' and the use of a laced stocking for the leg ailment. Case of the brother of Mr Patrick Campbell at Greenock who has dysentery and a discharging issue. or spirituous Liquors. – & live on Milk & Vegetables. must use laced Stockings properly adjusted to his legs. For his Flux the Strengthening Infusion below. For sweatening his blood the Decoction &c below. Take Decoction of Mezereon Take 2 ounces of Sarsaparilla Root, a drachm of peel of Mezereon Root, 2 ounces of grated Liquorice. Prepare according to the art – Label: Dec Antiscorbutic Decoction: a bottle every 24 hours. Continue use for 2 or 3 weeks. Take 2 ounces of Antimonial Wine. Label: Antiscorbutic Drops, fifty in a Draught of the Decoction at bedtime. a bottle every 24 hours Perstit usu pro ij vel iij septiman. of the Decoction h. s.